Anne Golon would be celebrated her 96th birthday this year. All her readers and fans remember her with love. Sixty years ago, there was published the masterpiece written in Versailles for the first time in France - the historic-adventurous novel Angélique, the Marquise of the Angels, which has achieved world renown. In honor of Anne Golon there was held the concert and a festive evening called "Angélique, the Marquise of the Organ". This concert was a part of the festival "Versailles in the Sound of Organ 2017" and took place at cultural center "Espace Richaud" in Versailles. The sixth volume The Road to Versailles from the series l'Intégrale is released by the publishing house Archipoche (Paris). Inside this book, there is an information about planned edition of the seventh and eighth volume - The War in Laces and Angélique and the King. The book edition of Angélique is continuing in France. The fourth volume The Indomitable Angélique from the series Version d’Origine is released by the publisher l’Archipel (Paris), and the fifth volume The Shadows and the Lights in Paris from the series l’Intégrale is released by the publisher Archipoche (Paris). The publisher Azbuka (Moscow) has published the eleventh volume Angélique in Quebec from the series Version d’Origine. The publisher Azbuka (Moscow, Russia) continues to publish the books Angélique from the 'Version d'Origine' series. The eleventh volume Angélique in Quebec will be released at the end of September. This "full version" of the work by Anne Golon is an asset to Russian readers, as some original books in Russia were also published with the abridged texts in the previous years. In France, there will be released the fourth volume The Indomitable Angélique by the publisher l’Archipel (Paris, France) on October 11. The publisher Archipoche (Paris, France) continues to publish the books Angélique from the 'l'Intégrale' series. The fifth book The Shadows and the Lights will be released on October 11, and the sixth book The Road to Versailles will be released on November 8, 2017. The edition of these books was originally planned for the beginning of the year 2015, nevertheless the issue was postponed. All readers hope that the publishing house will continue to publish of the next books from the 'l'Intégrale' series. The last farewell to the famous authoress Simone Changeux, more than sixty years around the world known as Anne Golon, was held at St. Louis Cathedral in Ile-de-France, Versailles. On Friday, July 14, 2017, writer Anne Golon left us forever. She was the most widely read and the most translated French novelist of the 20th century, and she dedicated to her historical book series Angélique almost all her life. This sad news on the death of Anne Golon was reported to local agenture AFP by daughter Nadine Goloubinoff on Saturday July 15, 2017. 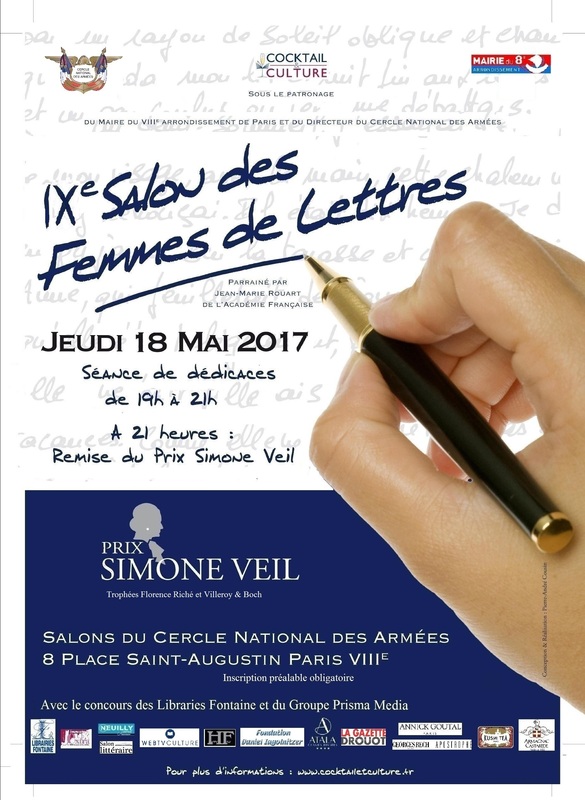 2017/05/18: Anne Golon at the 9th annual "Salon des Femmes de Lettres"
Anne Golon ought to have been for the awarding of the literary Award "Le Prix Simone Veil" at the 9th annual "Salon des Femmes de Lettres" in the palace "Cercle National des Armées" in Paris. As part of this festive event, there was a book-signing session, but Anne Golon was not able to attend due to ill-health. Anne Golon, author of the Angélique book series, translated into at least 45 languages, published in more than 320 different editions, with more than 100 million readers worldwide, celebrates her 95th birthday this year. All her readers and admirers are sending her love from their whole heart, and wishing her good health and a lot of vital energy. 2016/12/14: Anne Golon at the 7th annual "Salon de l’Histoire"
Anne Golon has attended the awarding of the literary Award "Prix du Guesclin" at the 7th annual "Salon de l’Histoire" (The Exhibition of History) in the palace "Cercle National des Armées" in Paris. As part of this festive event, there was a book-signing session with Anne Golon who has signed the books from the Angélique series. The third part of illustrated book in manga style was issued by the publisher Casterman. There we can see the first meeting of a young Angélique with her husband, the Count Joffrey de Peyrac. Anne Golon has signed the books from the edition Angélique: l'Intégrale and the books from the collection BD Angélique Manga in the Parisian palace "Cercle National des Armées". 2016/04/20: Anne Golon godmother of the festival "Women's novel 2016"
Anne Golon has sponsored the first year of the "Festival du Roman Féminin 2016" in Paris and she was signing the Angélique books during the meeting with the readers. Anne Golon is sending many greetings and love to all Angélique friends and readers who follow this website. Anne Golon has signed the new books from the edition Version d'Origine in the bookstore "Librairie Antoine" in Versailles. The second part of the illustrated book in manga style was issued by the publisher Casterman. Anne Golon has signed the new books in manga style in the palace "Cercle National des Armées" in Paris. The publisher Casterman (Tournai, Belgium) has issued the first part of the illustrated book in manga style. Anne Golon has signed the new books from the editions L'Intégrale and Version d'Origine in the palace "Cercle National des Armées" in Paris. Anne Golon has signed the new books from the editions L'Intégrale and Version d'Origine in the bookstore "Librairie Un ange passe" in Versailles. After the success in 2011, Anne Golon comes back to the festival Les Imaginales. The new Ariel Zeitoun's movie with Nora Arnezeder and Gérard Lanvin. The interview with Anne Golon.